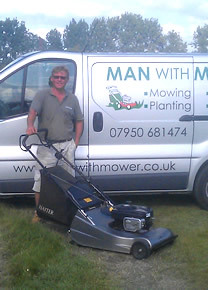 Man with Mower is based in Farnham and provides inexpensive garden maintenance to a variety of gardens both large and small. The frequency of visits is dependent upon the client's requirements and can be weekly, fortnightly or monthly. We also carry out "one off" visits to get those neglected gardens back into shape. For a no obligation consultation please call Peter on 07950 681474 or email a message here!